Watson-Marlow Pumps’ Qdos 60 peristaltic metering pump is designed to reduce chemical metering costs compared to conventional solenoid or stepper-driven diaphragm metering pumps. 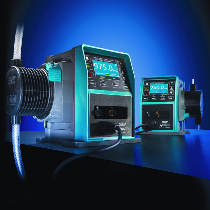 The Qdos range of pumps eliminates the need for ancillaries, boosts productivity, and cuts chemical wastage due to its highly accurate, linear and repeatable metering. Simple installation and easy, tool-free maintenance ensures that total cost of ownership is minimized. Watson-Marlow's patented ReNu pumphead technology provides a single, safely contained component for rapid maintenance without the need for tools. Qdos pumps are ideal for disinfection, pH adjustment and flocculation of drinking water, wastewater and industrial process water, as well as reagent dosing and metering in mineral processing tasks. The Qdos 60 is especially suited to chemical metering applications found in larger water treatment plants where flow demand is greater than that provided by the existing Qdos 30 model.